Parts of Horsham Park have been turned into a ‘muddy bog’ because of increasing numbers of runners using the area. This week they took to social media to complain about the quagmire and ask Horsham District Council what it was going to do about the problem. Hundreds of runners take part in a weekly 5km ‘park run’ every Saturday which is welcomed by residents, but they say it has resulted in turf on either side of paths being churned up. “It’s just a muddy bog,” said one. A spokesman for Horsham District Council said that heavy rain over the past three months - the highest levels on record - had exacerbated the problem. “The Park Run has been an enormous success. It is inevitable that usage during the winter months will result in a certain amount of damage to the turf. Fortunately, the majority of the areas quickly recover at the onset of the warmer spring weather. 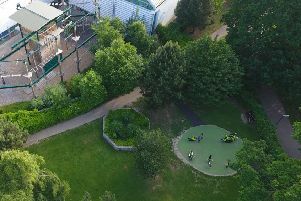 He said there was ‘heavy pedestrian use’ around the park’s duck pond where experimental planting had been taking place and the parks team planned to grass over the area in April.